The quiet diesel-electric submarine Carrera slid through San Diego Bay on Sept. 1 for the start of a three-month deployment to the United States, where the Chilean boat will train with 3rd Fleet’s ships, subs and aircraft. Carrera’s presence in a U.S. port – it calls the submarine piers at Point Loma Naval Base its short-term home – marks the fourth time the Chilean Navy is sending one of its small, stealthy subs to play with the U.S. fleet. The goal of the Diesel Electric Submarine Initiative, of course, is for the U.S. Navy and its foreign seagoing allies to train and operate together, namely with the mission of hunting down those quiet subs that get into the hands of rogue states or terrorist organizations. The stealthiness of the quiet diesels posts quite the challenge for sonar techs, aerial sub hunters and tacticians, and their growing proliferation in the Pacific region continues to worry naval commanders and is seen as a growing threat to U.S. national security and that of its allies. Last year, Thomson, a Type 209 boat in Chile’s fleet, trained off Southern California and in November headed back to their homeport of Talcahuano with good memories and a few smiles from some victories in the cat-and-mouse game at sea with U.S. sailors – including the crew of fast-attack submarine Asheville. 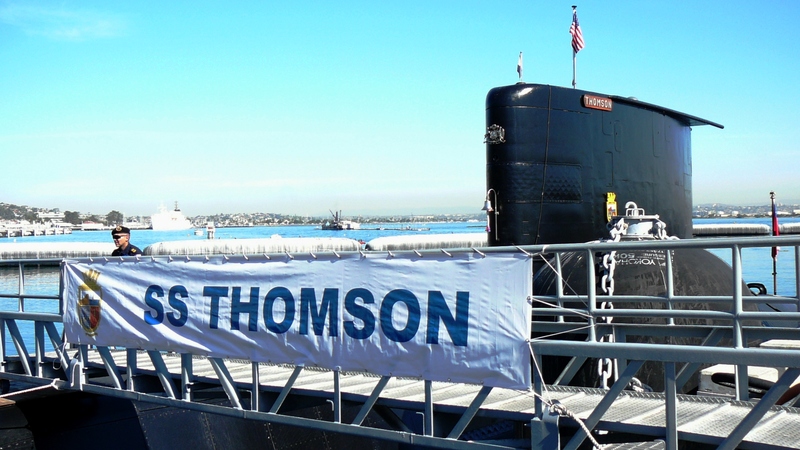 Thomson’s presence here in San Diego last year came months after a devastating 8.8-magnitude earthquake and tsunami struck Chile. Mother Nature’s fury devastated many communities, including homes of crew members assigned to the sub. But even as their military helped in recovery efforts in the ensuing months, the Chilean navy kept to its commitment and deployed the sub and its crew to San Diego. U.S.-Chile naval relations go as deep as the diesel-electrics. This week, the Chilean training ship Esmeralda, a masted sailing ship, is visiting Pearl Harbor, Hawaii, following visits to San Diego, San Francisco and Vancouver, Canada, where protesters complained about the ship’s seedier past as an alleged torture chamber dating back two generations to the days of dictator Augusto Pinochet. No such greeting expected in Hawaii, though.